Bhai Dhian Singh Mand who was arrested form Shambhu barrier on the border of Punjab and Haryana earlier today was presented before a local magistrate under charges of section 107/151 of Code of Criminal Procedure. He was sent to Nabha jail under preventive detention. 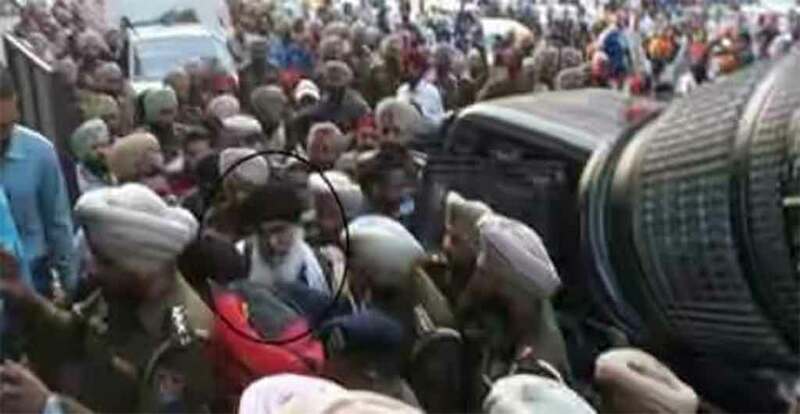 PATIALA, Punjab—Interim Jathedar of Akal Takht Sahib, Bhai Dhian Singh Mand has been re-arrested. Bhai Mand was on his way back to Sri Amritsar when he was arrested by the Patiala police today, May 8 at 1 AM. were arrested upon entering Punjab from the Shambu border. Bhai Mand and others are currently being kept at Ghanour police station in Patiala. Bhai Mand, along with other Sarbat Khalsa appointed Jathedars were returning to Punjab after having paid obeisance at Patna Sahib and Hazoor Sahib. After paying homage at Patna Sahib, Bhai Mand and other Jathedars arrived in New Delhi and were welcomed there by the Sikh Sangat. All three Jathedars are currently on tour of the five Takhts. They were planning to pay homage at Sri Darbar Sahib and Akal Takht Sahib in Sri Amritsar on May 10. “At late night on May 10, the police also carried out raids at Bhai Gurdeep Singh Bathinda’s house. They were not able to arrest him along with other leaders as he was not in the same car as Bhai Mand,” Bhai Bathinda’s son Gurbinder Singh Brar told Sikh24. Bhai Baljit Singh Daduwal, Bhai Amrik Singh Ajnala and Bhai Gurdeep Singh Bathinda are currently outside of Punjab. Just two days ago, on May 6, Bhai Mand had told Sikh24 that Sarbat Khalsa Jathebandis will be established Akal Takht Sahib secretariat in Amritsar. Bhai Mand had told Sikh24 that the secretariat office would allow Sarbat Khalsa Jathedars to provide guidance to the Khalsa Panth on various issues. As per internal sources within the SGPC, Sikh24 has learned that SGPC executives were not happy at Bhai Mand’s move to establish a parallel office to Akal Takht Sahib’s secretariat. SGPC is currently also tasked at elevating security around Sri Darbar Sahib for June 4 shaheedi samagam. Kotkapura :- Block Kotakpura Di Samuchi Akaali Panchayat Valon Astifa. Bhindranwale Not AGAINST Hindus? So WHY are SOME people so confused about Sant ji. Videos Police Attacked – Everyone including Bapu Surat Singh there at home arrested by the police..